Second ipsilateral breast tumor event (2ndIBTE) occurring after primary radio-surgical treatment can be treated by either salvage mastectomy or 2nd conservative treatment (2ndCT) including an accelerated partial breast re-irradiation (APBrI). We analyzed the impact of the GEC-ESTRO APBI classification (GAC) on the oncological outcome after APBrI. Between 2000 and 2016, 159 patients (pts) underwent a 2ndCT. 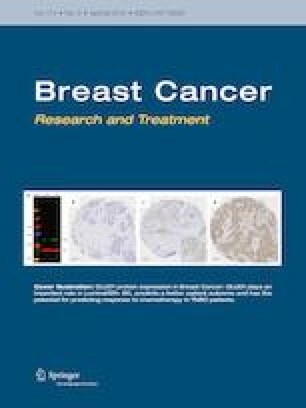 After lumpectomy, APBrI was performed using either low-dose (30–55 Gy reference isodose) or high-dose rate brachytherapy (28–34 Gy). Oncological outcome including 3rdIBTE, regional (RFS) or metastasis-free survival (MFS), specific (SS) and overall survival (OS) was analyzed according to GAC. Univariate (UVA) and multivariate analyses (MVA) were conducted to identify significant prognostic factors for 3rdIBTE. With a median follow-up of 71 months (range 62–85 months), 60 pts (42%), 61 pts (42.7%) and 22 pts (15.4%) were classified as low-risk (LR), intermediate-risk (IR) and high-risk (HR), respectively. For the whole cohort, 6-year 3rdIBTE-free survival, RFS, MFS, SS and OS rates were 97.4, 96.4, 90.3, 92.9 and 91.2%, respectively. Six-year 3rdIBTE-free survival rates for LR, IR and HR were 100, 95.8 and 92.9%, respectively (p = 0.003), while no significant differences were found between the three GAC groups for RFS, MFS, SS. In UVA, lympho-vascular invasion (p = 0.009), positive margins (p = 0.0001) and GAC high-risk group (p = 0.001) were considered as significant prognostic factors for 3rdIBTE, while, in MVA, high-risk group (p = 0.009) was the only prognostic factor. In case of 2ndIBTE, GAC could be used as a decision helping tool to discuss conservative or radical treatment options. Patient information remains crucial in order to accurately define the salvage therapy modalities. This study was performed according to the current French laws. JMHL is consultant for BEBIG Company. The other co-authors declare that they have no conflict of interest. This study was approved by the Antoine Lacassagne Cancer Center ethics committee.